This is the second time in the same day that I observed this behavior between this particular seven-month old female pup and her mother. Please see the previous posting. I had two thoughts that might be related to this: the first about Great Horned Owl dispersal, and the second about canine intuition regarding the alpha quality in another canine. I’ve seen Great Horned Owls lovingly raise their owlets for almost a full year, from the time they are born in late March, through the fledging stage when they leave their birth nest, and through months of teaching hunting and other survival skills. Then one day, towards the end of the Fall season, both parents — these are parents who have mated for life and have raised their owlets together for the last 15 years — turn viciously against their offspring forcing them to leave the area. There is room for only one mated Great Horned Owl pair in any territory due to limited resources. As time approaches for the new reproductive cycle to begin, at the end of the calendar year, any offspring born that year are driven away by their parents. I’ve always wondered what it must feel like to be so totally loved and cared for, and then have those who loved you suddenly attack you. This is what goes on. The young owls fly off to areas as close as the next park over, if there is room there, or as far away as across the US. My second thought stems from how my 2-year-old female dog reacted when we brought home a new 4-month-old puppy — a male. We found the puppy — abandoned — and we couldn’t just leave him. She must have intuitively known that he would be growing much bigger than her, and that, based on his behavior and activity level and disregard for her, that he would assume the dominant status eventually. It’s only with hindsight that we came to know that this was going on right from the start. Over an extended period of time we noticed that the alpha status had segued to him, and she just accepted the inevitable. 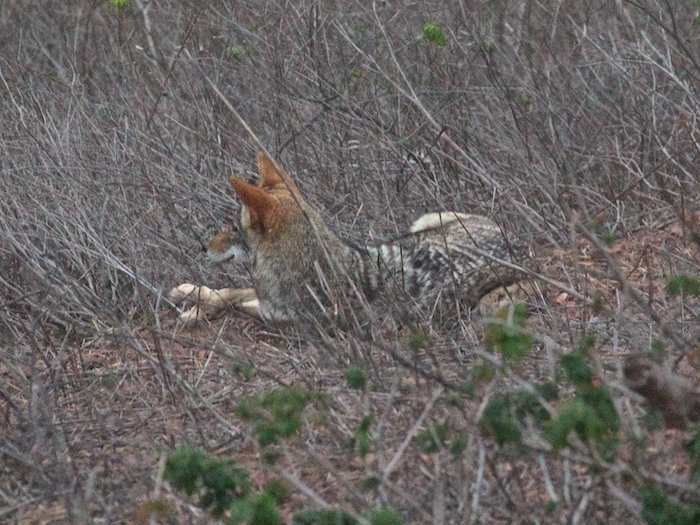 An alpha coyote in the wild, it seems, would do its best to prevent this from ever happening, especially from one of its own pups who began showing signs of any kind of dominance. So, we’ll soon see how this situation pans out: if it settles down, or if it leads to something. When “disciplining”, the alpha of a family pack gently puts her/his mouth around the snout of a coyote who is out-of-line, and maybe turns the “underdog” on its back for a few moments. This discipline could be reinforced by the alpha placing its paws on the back of the fellow who is out-of-line. The subordinate quickly shows deference and everything is back to normal within a few seconds: the alpha status is reconfirmed and everyone knows their role in the family hierarchy. This is not what I saw today, twice. The most probable reasons involve defiance of the alpha figure, in this case the mother, or possibly disobeying commands that are meant to protect the family pack and help with its survival. Hierarchy has to be rigidly maintained in a healthy coyote family. Or, maybe the alpha needed to bring down the highest-ranking pup? Maybe it was becoming too powerful among its siblings? Then again, this harsh discipline might just be the first steps in forcing dispersal. But then, why would the mother be targeting just the one pup, a female? I suppose there are all sorts of possibilities. I don’t know enough at this stage to state with certainty what is going on, but I tend to think the punishment was for the youngsters own good, and not self-aggrandizement by a mean mother. But I was totally taken aback as I observed it. The youngster in this observation is almost seven-months old, a female. She approached her mother, belly scraping the ground, showing deference, submission and caution. This did not include the wiggly squealing happy meeting that I usually see. The pup approached and quickly turned on her back, with the aid of the mother’s legs. The mother then stood, crouched low, over the youngster for a long period of time, snarling now and then at the slightest hint of movement or protesting from the pup. At one point, as the pup lay there quietly, the mother licked the female pup’s private parts. and then the pup’s inner leg. The pup remained quiet at first. Then the pup seemed to protest and tried getting up, and even almost got up at one point. The mother snarled viciously and was able to quickly put the pup down again. Then the pup did break away for a moment, but the mother quickly used her entire body to hold the pup down. There were then a series of hard punch-bites from the alpha-Mom. This was all carried out in silence except for one high pitched whimper from the pup near the end of the “session”. The pup then was able to get up and dash off for cover into some bushes about 50 feet away. Mom then sat up and looked ahead and around, without a second glance towards the pup in the bushes. Within a few minutes she headed down the hill. The pup came out of the bushes and watched — watched longingly and sadly as the mother headed off. Were they not reconciled? Would this continue? At the bottom of the hill the mom looked back, seemingly disapprovingly, at the pup, and then continued on. The pup stayed at her spot by the bushes and looked very sad, watching the mother disappear into the distance. Many minutes later, the pup, too, headed down the hill, but in another direction. 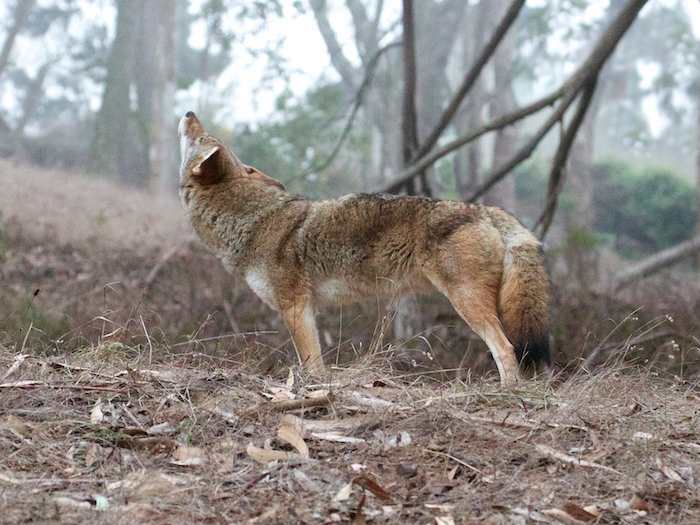 Charles Wood and I both have written a number of postings on coyote rendezvous behavior. Coyotes are social animals who, except for transients and loners, live in nuclear families. They mate for life — coyotes are one of only 3-5% of mammalian species that do so — and the family is what centers their lives. Hey, not so different from us! 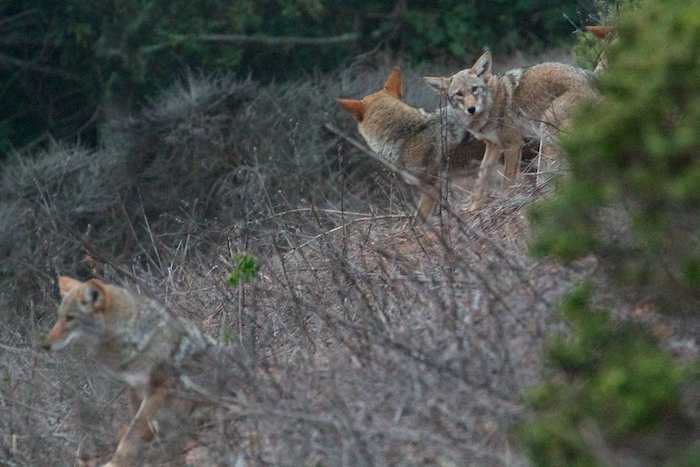 I recently wrote about a coyote mated pair — one with a den full of infant pups — who took off to rendezvous at dusk — like a couple on their way to a tryst in the dark. Mated pairs are special buddies, and you can see it in that posting. I’ve also assembled a photo essay for Bay Nature on “Raising Kids in the City” to let people know about how social and family-minded coyotes are. Today’s rendezvous was a family one. Mom and two kids were out lolling around on the hidden side of a hillside, waiting for dusk to get a little heavier. After seeing them, I kept walking and found Dad sleeping in a little ball, about 400 feet away from where the others were. I settled down to wait for some activity. Suddenly Dad sat up, as if he knew that the others were waiting for him. What was his cue? He hadn’t seen the others — they were within his line of sight, but he had not looked in their direction. I’m sure he hadn’t heard them or smelled them. Maybe it was a cue in his circadian rhythms, much like our own, built in and influenced by daylight hours, or possibly by the movement of the moon? He allowed himself a long stretch, and then scouted the length of a path before walking slowly into a clump of bushes which were in the direction of the place where the other family members were hanging out. Since I could no longer see Dad after he disappeared into the bushes, I headed back to the hillside where I had first spotted the 3 other coyote family members. By the time I got to the spot where I could see them again, Dad was there. His arrival had sparked great excitement. Tails were wagging furiously. All coyotes, except Mom, were falling all over each other and doing their little wiggle-squiggle thing that they do when they greet one another. Mom hadn’t moved from her sphynx-like pose, arms extended and crossed, a few feet away. Now three pups were visible, but the shyest scurried behind a bush when she saw me. three coyotes look up at an owl. As the excitement of the greeting calmed down, Dad approached the two remaining pups, one at a time. The first one he nudged in the snout, and then he poked his own snout into its fur, over and over again, twisting his head this way and that, in a grooming sort of way. The young pup closed its eyes and let itself enjoy the affectionate massage which went along with the grooming. After about four minutes Dad moved over to the second pup. The first pup got up to follow and stuck its snout under Dad to smell his private parts. Dad did not like this and must have given a sign, because the pup turned away quickly and moved off. Then Dad groomed the second pup: repeatedly nudging the pup’s head, licking and cleaning it. He then moved to the pup’s rear area and seemed to do the same, though I was on the other side so I could not see exactly where the licking was occurring. We heard the sirens — not so loud and long as usual — but we thought there might be the possibility for a concert, so we waited. We were right! The sirens part was very short — I don’t think I caught any of it on the tape, but the coyotes continued their serenade well after the sirens had passed. And, the show didn’t end there. When they were finished with their yips, squeals and barks, one of them approached the other and began grooming — in this case, taking off ticks one be one — the same as I have shown before. This particular video is different from my others. The entire first half of it was blurry — the camera mechanism for automatic focus just couldn’t seem to find itself — it kept zooming in and out without ever focusing, so all I had was one big blur for that section of the video. I was so disappointed that I might not be able to use the video clip. A friend of mine offered to help, and look what he came up with!! I think it’s fabulous, really superb!! And you get to hear the vocalizations throughout. You can imagine my disappointment when this video came out blurry — even when I refocused it stayed blurry. However, the sound is clear: two coyotes yip after hearing a siren. The other coyote initiated the yipping — that one was about 150 feet away from this one, and this one joined in. It was a very short yipping session which lasted just over what I was able to capture in the video. The same high-pitched sounds that were used here for responding to sirens, are also used as happy greeting vocalizations. Some individuals mistakenly have thought that these high pitched squeals were the sounds of puppies and spread rumors that there were coyote puppies around, when in fact, it was just adults squealing their adult squeals. As you can see from the video, these are adult vocalizations. And, again, there were only two coyotes involved, though one might easily think that the sounds were coming from many coyotes.